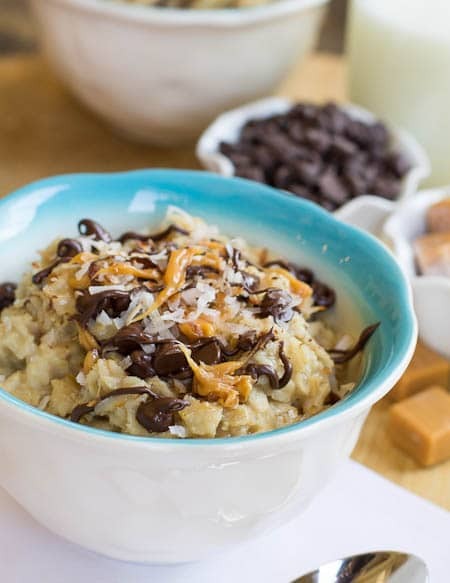 This Samoa Oatmeal has all the flavors of the popular girl scout cookie: coconut, chocolate, and caramel. A deliciously sweet way to start the day. It’s girl scout cookie time 🙂 🙂 :). I can resist almost all packaged cookies, but not Girl Scout Cookies. They are my favorite cookies. And the fact that they are only available for a limited time each year makes them all the more enticing. And let’s not talk about the cute little girl scouts who park themselves directly in front of the entrance to my grocery store and flash me those pretty smiles while asking me to please buy a box of cookies. Can’t say no. The first time I saw them I bought a box of samosa, thin mints, and tagalongs. Samoas and thin mints are tied for my favorite. They’re so different it’s kind of hard to compare them. Today I walked by the same cookies and I just bought cookies for the troops. Yay me! But luckily before I started the Jenny Craig Girl Scout Repentence, I made this delicious Samoa Oatmeal. It’s filled with that same chocolate, caramel, and coconut goodness of a samoa cookie. I was a huge hater of shredded coconut until I tried a samoa cookie about 5 years ago. Samoa cookies are so good they made me give up my 35+ year hatred of shredded coconut. I still remember the time (I think it was my 5th birthday) my grandmother had a teddy bear cake made for me. I had a huge smile on my face when I first saw it, but when it was placed in front of me my heart sunk. There may have been tears shed. It was completely covered in shredded coconut. 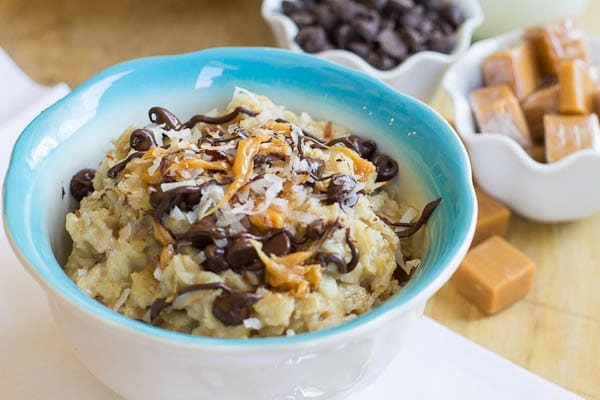 If I had just tried a samoa cookie or maybe some of this samoa oatmeal before then, I most certainly would have yummed it up instead of refusing to take a single bite. Oatmeal with all the chocolate, caramel, and coconut flavor of a Girl Scout Cookie. Chop each caramel square into 4 smaller squares. Stir in oats. Cook for 5 minutes over medium heat, adding the caramel pieces with about 1 minute of cooking time left. To serve, top with coconut and chocolate chips. This entry was posted in Breakfast and tagged caramel, coconut, girl scout cookies, oatmeal. Bookmark the permalink. Wow! I didn’t have caramels or chocolate chips so substituted 1 TB Cacao powder, 1 TB Brown Sugar and a few drops of butter extract. Came out amazing!! Thank you so much for posting this delicious recipe! It’s a delicious way to start the day isn’t it? You may have convinced me to try oatmeal again. Typically I don’t like it but this version sounds so good! Oh goodness this oatmeal!! I love oatmeal but this … now this will blow my normal oatmeal right out of the water!! lol So creative! This oatmeal looks soooo good! Totally loving your pictures and the caramel is the cherry on top! great oatmeal recipe! thank you! Gorgeous pictures! And seriously BEST idea ever! Love this! 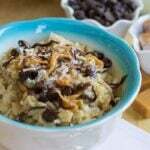 I adore oatmeal and have had it with peanut butter and chocolate before – but not shredded coconut! Fantastic idea – thank you! 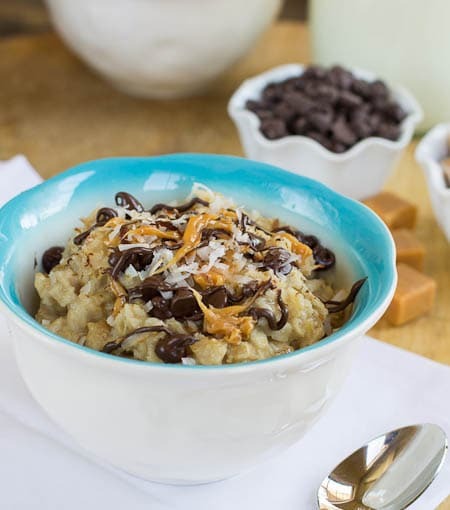 I love the Samoa flavors, and I think adding them to oatmeal is a fantastic idea! Oh my! I can have this oatmeal for my breakfast every single day. So beautiful and so delicious. So funny! I was creating some samoa inspired things this weekend! Love that I can have cookie flavour for breakfast! YUM! Unbelievable that oatmeal can be sooooo good! This is the best idea for oatmeal ever!! OH no, don’t do this to me!! Now I want this now!! 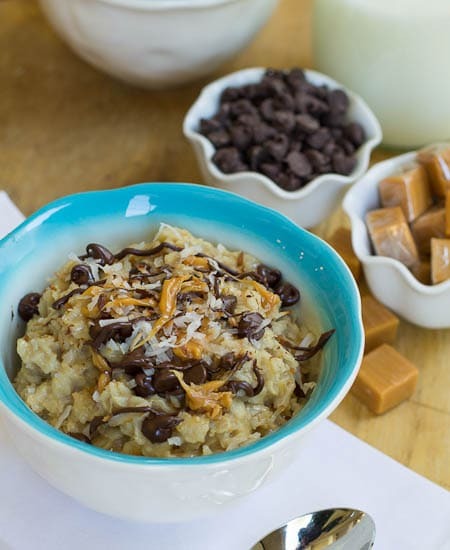 my daughter loves chocolate chips in her oatmeal and she’s going to love this recipe! This looks absolutely FANTASTIC Christin. Like super amazing! Love the pictures AND the ingredients! YUM! Oh wow! I’m a devoted Thin Mints girl and while I love coconut milk, I have not learned to like shredded coconut. The Samosas do look incredible and now I’m thinking I need to give it a taste. I have a feeling it might be a “bad” idea though…probably too good. This oatmeal is incredible. I know what you mean! Sometimes I wish I had never tried a samoa. Life might be easier if I didn’t lie so many things and I’d definitely spend less time exercising. Ok this is pretty awesome and I can’t wait for breakfast tomorrow morning! I am making this ASAP because samoas are my favorite, and what a great way to start the day! I hope you had a great weekend, Christin! Oooooomg. I’m regretting my breakfast choice now!